A neighbor knocked on Rick Burgess's door at about 9:30 p.m. to tell him a fire was coming towards his home in Ventura, California. When he looked outside he saw a column of smoke, and the hills were already starting to turn orange. He loaded up his truck with a collection of native plants he was using to write a countywide plant guide, and barely had enough time to get out. Editor's Note: As of 7:30 am EST Thursday the California mudslides death toll has risen to 17. Southern California, which just endured the largest wildfire in state history, is being bombarded by flooding and destructive mudslides triggered by torrential downpours. 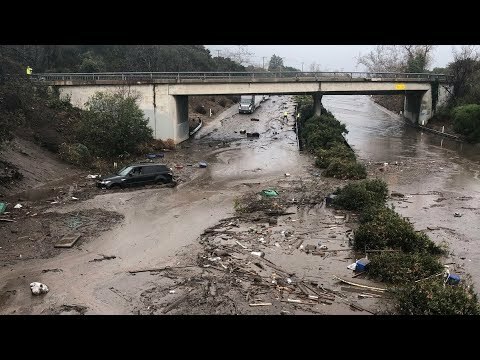 The "waist-high" mud destroyed homes, uprooted trees and washed away dozens of cars in Santa Barbara County, CNN reported. More than 8,400 firefighters are battling the Thomas Fire raging in Southern California's Pacific coast. The massive blaze, which charred 270,000 acres, destroyed 1,024 structures and took the life of 32-year-old Cal Fire engineer Cory Iverson, is officially the third largest wildfire in state history. Notably, the Thomas Fire—now 45 percent contained—could potentially take the dubious title of California's largest-ever wildfire since record-keeping began in 1932. The state's largest is the 2003 Cedar Fire which burned 273,246 acres and killed 15 people. California is burning again. A massive wildfire fueled by powerful Santa Ana winds has spread some 31,000 acres in Southern California, destroying 150 structures and forcing 27,000 people to evacuate. The outbreak comes not long after October's string of devastating wildfires in Northern California that killed 44 people—the deadliest in state history. Insured losses from fires in Northern California have topped $1 billion and are expected to rise "dramatically," state insurance officials announced Thursday. Firefighters continue to battle against 17 wildfires that have burned more than 220,000 acres in California, Cal Fire announced in a Friday update. The death toll from the Northern California blazes has risen to 31, the deadliest week for wildfires in the state's history.